A study has found a correlation between the birth month and the likelihood of being afflicted by certain diseases in 55 out of 1,688 conditions. Some of these links were previously known, but 16 had not been identified before. The U.S. military wants you … to design a better atomic clock. The Defense Advanced Research Projects Agency (DARPA), the branch of the U.S. Department of Defense tasked with developing new technologies for the military, recently announced a new program called Atomic Clocks with Enhanced Stability (ACES). The program aims to design anatomic clock that is 1,000 times more stable than current models, which are so precise that they arecapable of maintaining perfect time for billions of years, neither gaining nor losing 1 second during that time. This is one reason the military wants to build more stable clocks — they want ones that stay synchronized even if they are out of contact with GPS systems for extended periods of time. As part of the ACES program, the Department of Defense wants to have atomic clocks that are small enough to fit inside a wallet and that can run on a quarter of a watt. That second parameter will likely be the bigger challenge, Kitching told Live Science. Power is such a problem because of the way atomic clocks work, Kitching said. In an atomic clock, the “pendulum” is an atom, usually of an alkali metal like rubidium or cesium. The metal is put into a tiny vacuum chamber, surrounded by a piece of silicon. Then, both are sandwiched between pieces of glass. The metal is warmed up, and some of its atoms separate, forming a vapor. Even the most precise atomic clocks will drift, and the most sophisticated ones in labs like the NIST are operated at extremely low temperatures and are cooled with room-size laser beams. Both of these factors mean it will be challenging to make atomic clocks wallet-size and less power-hungry, said Kitching. Robert Lutwak, DARPA’s program manager for the atomic clock project, agreed that fulfilling all the requirements set out by the agency will not be easy. “NIST has a fairly unique mission — to demonstrate the highest possible accuracy in a laboratory setting. As such, they “pull out all of the stops” to achieve the optimum performance without regards for cost, size, weight, or power, and without need for robust continuous operation over time, temperature, vibration, shock, or other real-world environments,” he told Live Science in an email. The ACES program will have a budget of up to $50 million and will include three phases, according to DARPA. The teams chosen to take part in the first phase of the program will build their clocks in a laboratory and have to show that the parts operate together as an atomic clock with better stability than existing models. The teams chosen to continue the program will be asked to pack their clocks into a space smaller than 2 cubic inches (33 cubic centimeters). The final stage will involve demonstrating that the atomic clock can fit into a space less than 3 cubic inches (49 cubic cm), along with all the associated electronics. An earlier DARPA program that lasted from 2000 to 2009 managed to shrink atomic clocks by a factor of 100 and create ones that were stable by a factor of 1 in 10 billion each second (meaning they will drift one second every 317 years). “The goals of the ACES program are to advance these by at least an order of magnitude,” Lutwak said. On Feb. 1, DARPA will host an event to provide additional details about the ACES program. Follow Live Science on Twitter @livescience. We’re also on Facebook &Google+. Original article on Live Science. 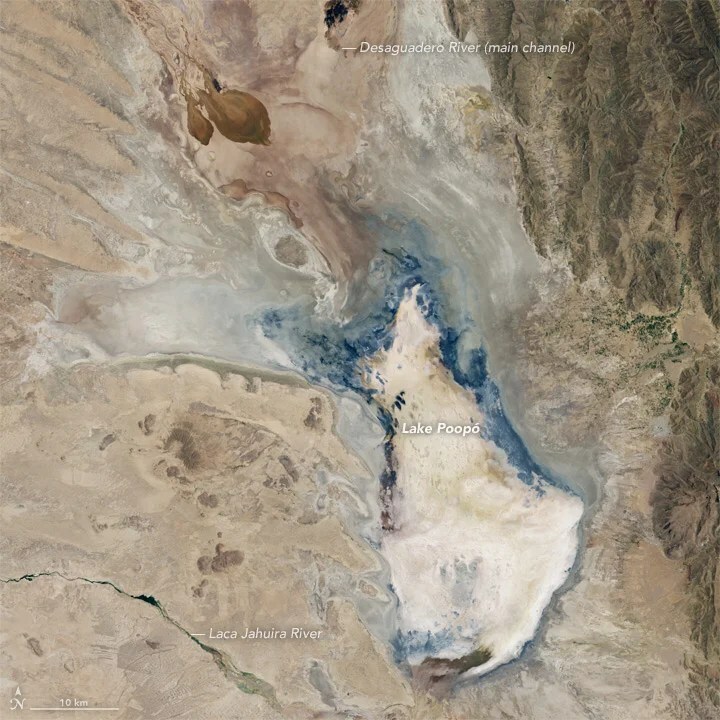 This satellite image shows the outline of where Bolvia’s Lake Poopó used to be. Once the county’s second largest body of fresh water, it’s now dried up because of recurring drought and water diversion projects. Typically, rainfall during the wet season (which runs from December to March) replenishes the lake. But we’re now well into January and rain remains scarce. 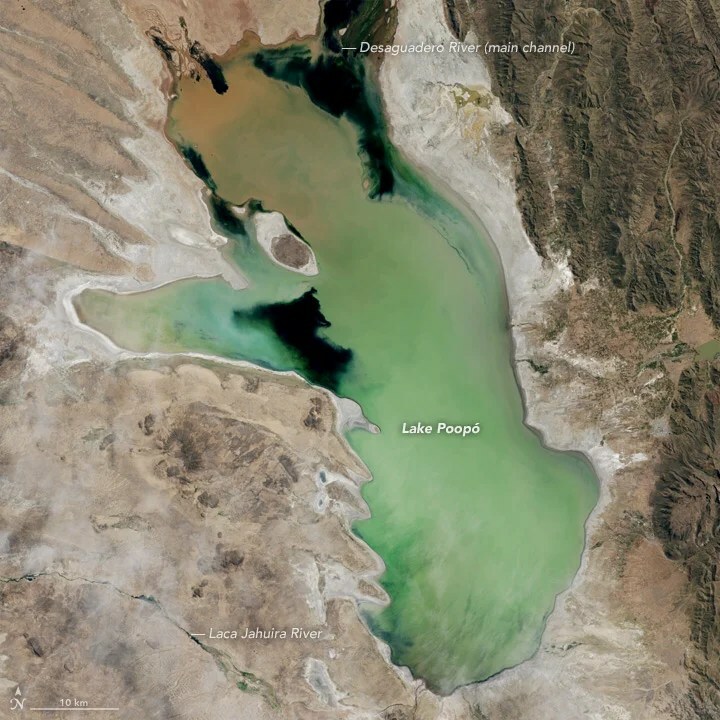 The image above was taken on April 12, 2013, and shows Lake Poopó when it’s filled with water. The one below was taken just six days ago on January 15, 2016. The water is essentially gone, replaced with dusty sand flats. The effect on the environment and ecosystem has been devastating. “This is a picture of the future of climate change,” says Dirk Hoffman, a German glaciologist who studies how rising temperatures from the burning of fossil fuels has accelerated glacial melting in Bolivia. As Andean glaciers disappear so do the sources of Poopo’s water. But other factors are in play in the demise of Bolivia’s second-largest body of water behind Lake Titicaca. Drought caused by the recurrent El Nino meteorological phenomenon is considered the main driver. Authorities say another factor is the diversion of water from Poopo’s tributaries, mostly for mining but also for agriculture. A study by the German consortium Gitec-Cobodes determined that Poopo received 161 billion fewer liters of water in 2013 than required to maintain equilibrium. “Irreversible changes in ecosystems could occur, causing massive emigration and greater conflicts,” said the study commissioned by Bolivia’s government. A similar situation is happening in California, where the Salton Sea—a massive man-made lake—is shrinking, releasing dangerous toxins into the environment. Top image: Jesse Allen, using Landsat data from the U.S. Geological Survey. Silverfish (Lepismatidae) are ancient insects that lack wings and have shiny scales all over their bodies. They are well adapted to living in homes because they can survive on low-nutrient materials such as crumbs, dead insects and even glues, paper and leather. No matter how well you think you know your home, it holds a number of dark corners and hidden spaces that you don’t look at too closely from day to day. And more likely than not, these nooks and crannies host a vast range of tiny squatters that have somehow found their way in from outdoors, and in greater numbers than you might expect, according to a new study. But don’t panic. They really don’t want to bug you. Turns out, there are more of them than you’d think, and they’re quite a diverse group. The researchers visited and sampled homes within a 30-mile (48 kilometers) radius of Raleigh, North Carolina, collecting any living or dead arthropod that they found in attics, basements, bathrooms, kitchens, bedrooms and common areas. They discovered that each house could play host to many hundreds ofarthropod species, with an average tally per home of about 100 species representing 62 arthropod families. Book lice (Liposcelididae) are tiny insects found in many habitats, often in animal nests and human homes. They are related to true parasitic lice, but instead of blood and skin, book lice feed on mold, dead insects, stored food products and other bits of organic matter. Many of the species they found will sound familiar to most people: Flies, beetles, wasps,spiders and ants were the species most frequently seen and collected, making up about 73 percent of all of the arthropods identified in the survey. Gall midges, tiny flies measuring about 0.04 inches (1 millimeter) long, were commonindoor visitors, appearing in all of the homes investigated. From all of the houses, the scientists compiled a list of 579 species from 304 families — and they say the list is probably far from complete. Michelle Trautwein, co-author of the study and the Schlinger chair of dipterology at the California Academy of Sciences, said in a statement that this represents just a “first glimpse” of the species that cohabitate with humans. Matt Bertone, lead author of the study and an entomologist at the Plant Disease and Insect Clinic at North Carolina State University, told Live Science that a surprising number of people volunteered their homes for the survey; he and his colleagues gathered more than 400 responses within a couple of days. They eventually narrowed them down to 50, first making sure that participants understood that the scientists’ goal was collection — not extermination, Bertone said. The researchers conducted the survey between May and October, to zero in on arthropod groups that were likely to invade homes at any time, rather than those that move into houses when it turns cold outside, Bertone said. To find the arthropods, a team of entomologists donned headlamps and knee pads, because they “learned early on that crawling around on the floor takes a toll on your knees,” Bertone said. Armed with flashlights, tweezers and aspirators, they traveled from room to room, searching ceiling to floor, in closets and corners, in cut flowers and on potted plants, covering all areas that were easily visible. In one case, the homeowner’s children came home early and pitched in to help with collection. “And then, at the end of the process, we lined up all the vials and showed the homeowner, “‘This is what your kitchen had in it; this is what was in your den, or your bedroom,’” Bertone told Live Science. Distribution of arthropod orders across all room types, in 50 homes. If you’re less than thrilled at the thought of these unexpected roommates, you’ll be pleased to know that the researchers identified many of them as short-term visitors that arrived accidentally, won’t survive very long and aren’t likely to reproduce. They won’t hurt you, either, the researchers added. Although many of the species that Bertone and his colleagues found were predatory — like spiders, centipedes, wasps and beetles — they can’t bite people. In fact, some may actually help out around the house by consuming harmful species — the arthropod equivalent of pitching in with household chores. The findings were published online today (Jan. 19) in the journal PeerJ. Follow Mindy Weisberger on Twitter and Google+. Follow us@livescience,Facebook & Google+. Original article on Live Science. The fizz that bubbles up when you crack open a can of soda is carbon dioxide gas (CO2). Soft drink manufacturers add this tingling froth by forcing carbon dioxide and water into your soda at high pressures—up to 1,200 pounds per square inch. The “fssst” you hear is millions of carbon dioxide molecules bursting out of their sweet, watery prisons, where they have been held against their will. An unopened soda can is virtually bubble-free because the pressure inside the can keeps the carbon dioxide dissolved in the liquid. When you crack open the can, you release the pressure and allow the gas bubbles to wiggle free from the liquid and rise to the surface. This requires energy because in order for the gas to break free from the liquid it has to overcome the force holding the liquid together. One way to input energy is to shake the beverage. This adds the zing needed to unleash more tiny bubbles and add real splash to a celebration. Follow Life’s Little Mysteries on Twitter @llmysteries. We’re also onFacebook &Google+. Does China’s Cat-Eyed Boy Really Have Night Vision? Nong You-hui’s teachers and parents claim he can see in the dark. According to a news reel from China, a young boy there possesses the ability to see in the dark. Like a Siamese cat’s, his sky-blue eyes flash neon green when illuminated by a flashlight, and his night vision is good enough to enable him to fill out questionnaires while sitting in a pitch black room — or so say the reporters who visited Nong Yousui in his hometown of Dahua three years ago. The footage of Nong and his strange-looking eyes originally surfaced in 2009; it got little attention at the time, but is now making a splash all over the Web. If the boy really does have a genetic mutation that confers night vision, then he would be an interesting subject for analysis by vision scientists, evolutionary biologists, and genetic engineers alike — but does he? The experts we shared the video with say Nong does have unusually colored irises considering his ethnicity, but he’s not the next step in human evolution. “It would be easy to test the boy’s eyes for retroreflection (eyeshine), which would be indicative of a tapetum lucidum,” said Nathaniel Greene, a physicist at Bloomsburg University of Pennsylvania who has studied retroreflection. In fact, such a test is run in the video. Furthermore, there is no single genetic mutation that could produce a fully formed and functioning tapetum lucidum, Reynolds explained; such an ability would require multiple mutations, which don’t just happen all at once. Evolution happens incrementally, he said, not by leaps and bounds. “Evolutionarily, mutations can result in differences that allow for new environmental niche exploitation. But such mutations are modified over long periods. A functional tapetum in a human would be just as absurd as a human born with wings. It can’t happen,” he told Life’s Little Mysteries. On the other hand, in the footage, the reporters gave Nong a questionnaire to fill out while sitting in a dark room, and they acted surprised by his ability to see and complete the fill-in-the-blank form. Even if he doesn’t have cat eyes, he may nevertheless have unusually good night vision, Reynolds said. He could have a rod-rich retina, for example — a retina that contains a higher than usual number of cells involved in light detection. Or the video could be a total hoax. Editor’s Note: Adam Hickenbotham, an optometrist and clinical researcher at the University of California, Berkeley, contacted us to say he believes Nong has a mild case of ocular albinism. This would explain the boy’s lightly-pigmented irises, and would also cause him to have a lower than usual amount of pigment in his retinas. this would make them appear slightly reflective, and would cause Nong to have difficulty seeing in bright light. 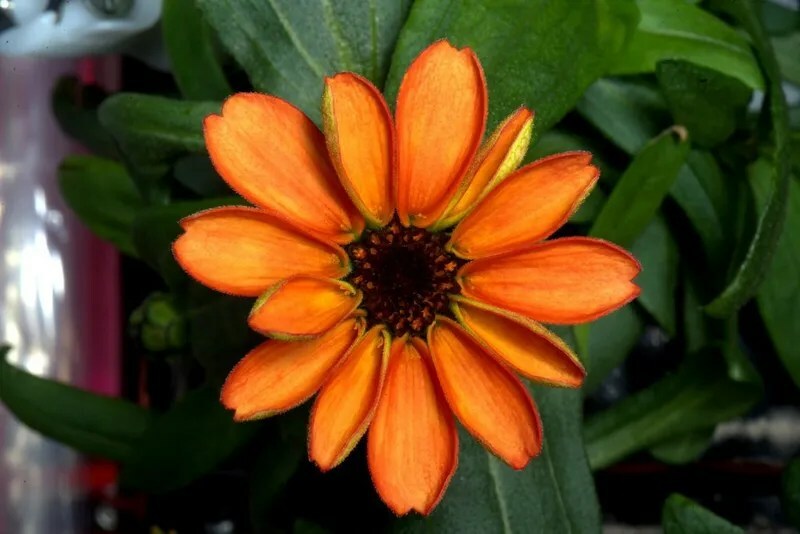 The first flowers to ever grow in space are blooming on the International Space Station today. Despite fears of over-watering, the crew coaxed the zinnias into a burst of colour in their zero-g vegetable garden. Zinnias are edible blooming plants that are usually on the easy ends in the spectrum to grow. They’re the second plant to be tested in the space station’s hydroponic VEGGIE lab. Astronauts taste-tested their previous crop, lettuce, last last year. Zinnias are most commonly eaten in salads, but also made a tasty accent to tacos. So, gardeners: How does this flower look different than your terrestrial blooms?